Science can’t explain it. Religion can. In the Russian and Catholic churches, as well as in Buddhism, it is believed that if a body does not decay after death, it is a sign of holiness. Though it seems unbelievable, photographic evidence exists of bodies that have remained intact for decades or even centuries. This should not be confused with bodies that were preserved either by deliberate embalming practices (such as Egyptian mummies) or by specific environmental factors. The incorruptible bodies of people who led pure and holy lives defy the laws of nature. Some of these bodies are often found to be still flexible, warm or accompanied by a sweet fragrance years. In Russian practice, such physical remains are called relics. Incorruptibility is one of the clearest indicators of sainthood and one of the most tangible examples of what believers would call a miracle. Where modern science fails to explain why these bodies did not disintegrate, the mystical, religious world can offer explanations. One is that these holy people were so filled with divine energy, that it warded off decay even after death. To Christians, who believe in the spiritual world, this explanation makes complete sense. Not all saints bodies are incorrupt in the same way. Some saints bodies, like St. Alexander of Svir, a saint who was born in 1448, continue to look almost the same as when they were buried. Others remain intact, but darken and shrivel over time. For example, St. John of Shanghai and San Francisco’s relics were found to be intact but turned to dark amber after they were washed. Still other relics are incorrupt in some specific areas of the body. 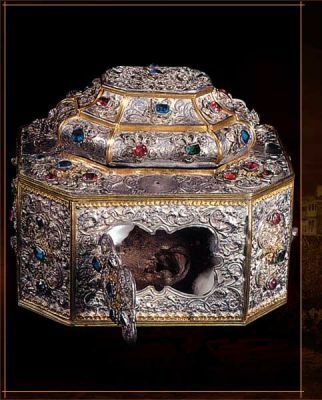 For example, the skull of St John of Chrysostom, an Orthodox saint who lived in the 4th century, while fully bone, still contains an ear that is completely intact. Often, the limbs that remain uncorrupt are symbolic. For example, it is believed that St John’s ear remained because the Angel of the Lord whispered into his year while was writing his spiritual works. Believers often travel to venerate relics. 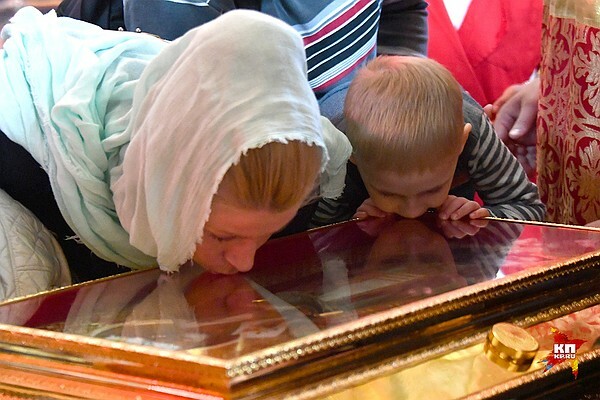 The typical Russian practice of 'venerating' a relic or icon is to cross oneself and kiss the glass covering while praying. Venerating relics offers a moment of intimate connection with a beloved saint. As when we treasure items that belonged to someone we loved, Russian Orthodox Christians believe that by venerating relics they offer respect and love in a tangible to someone they love and trust and who, though dead, can still hear their prayers. Here’s an example from recent times. 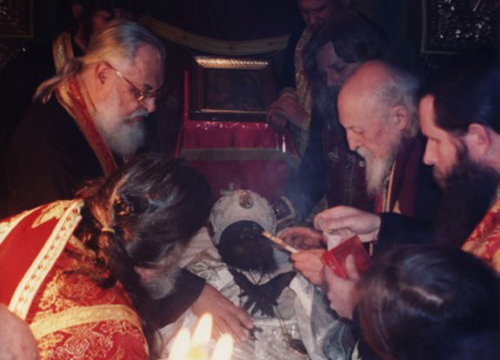 Archbishop Dmitry of Dallas died in 2011 and his relics were found incorrupt in March 2016. Archimandrite Luke, who was present at the discovery of Archbishop Dmitry’s relics, said the body was found in a damp and musty place. A local specialist who was hired for the exhumation process was absolutely shocked when he saw the relics, since he knew that the particular area where Archbishop Dmitry had been buried was most conducive to decay. "Above is an image taken today of the incorrupt body of Archbishop Dmitri of Dallas. He died in the summer of 2011 and was buried unembalmed, according to Orthodox tradition. 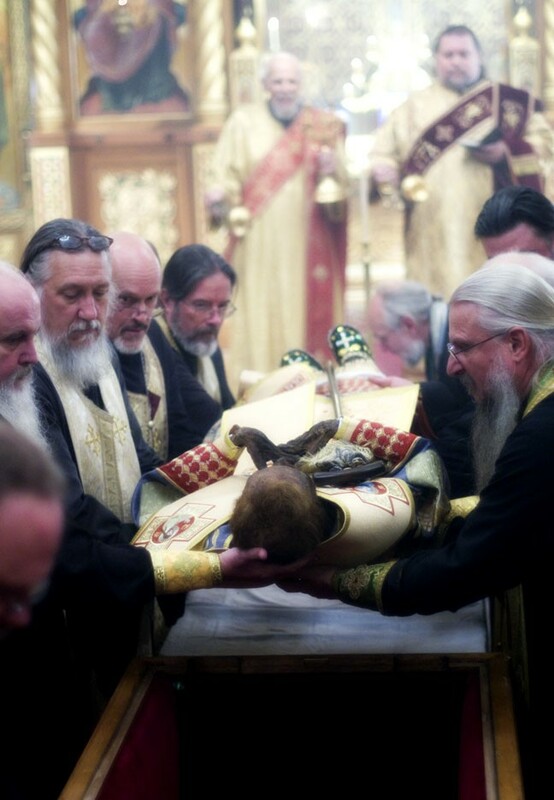 On Friday his body was disinterred for transferral to his new tomb in St. Seraphim Orthodox Cathedral in Dallas, which was his own. When the cemetery personnel opened his coffin, they found Vladyka Dmitri incorrupt. UPDATE: A couple of readers rightly correct me for giving the impression that in Orthodoxy, an incorrupt body is incontrovertible evidence of sainthood. It is not. I am personally choosing to take this as a definitive sign, because I knew Vladyka Dmitri. But doing so is not the way of the Orthodox Church. If he is to be canonized, that will be something for the Church to decide, after much discernment."